Storytelling started when life on earth began, and in this podcast, we discuss how to tell a story that engages and the importance of sharing. From Romeo and Juliet to Lady Di, to the person next door there is something to learn about the art of storytelling. VertiMax has launched a new certification for its equipment and is establishing trainings across the United States and globally. "Our team of master trainers are some of the finest sports training coaches in the world.” says Robert Dyer, fitness industry advisor and principal in the investment firm Vedere Ventures. Dyer has been working with the company on its training and programming efforts along with the American Council on Exercise (ACE) to create an education solution so professionals could take advantage of all of the unique advantages that VertiMax equipment provides. The VertiMax Training Certification Course delivers the product knowledge, coaching knowledge and skills to effectively and safely utilize the VertiMax product line while training athletes and clients in universal training. To date, 140 Trainers have already received certifications within 40 trainings across the US. Vertimax provides sports, functional and rehabilitative training solutions to fitness facilities, training centers, and high school and college athletic programs, including for use by student and professional athletes at home or on the field. Thousands of U.S. high schools and 80% of D1 universities utilize VertiMax technologies and platforms including their portable Raptor product. Over 40% of professional US sports teams like the Baltimore Ravens and New England Patriots, among others, utilize the technology extensively. To learn more visit http://www.vertimax.com or follow @Vertimax on major social networks. Vedere Ventures is a boutique private equity firm launched in 2016, with investment business around the world. Led by industry leader Bryan K. O’Rourke, and his longtime partner Robert Dyer, among other fitness industry leaders, Vedere Ventures is composed of a team of Operators at heart, with the mission to work with all portfolio companies directly to add real, measurable value. Investing in the companies of tomorrow. Built on the timeless fundamentals of today. It occurred to me that MAKING YOUR OWN PATH can actually apply to anything in life and the path you start on may not be the path you stay on. Making your own path is about being different and if you’re not different, you’re the same. A compelling statement here-if we had gone along the path that others pursued we would not have been successful. We had team buy in, team support, team strength and a little bit of West Texas…we had swagger. The work felt honest and working with a wonderful team of people felt even better. Don’t be like everyone else or think you need to be like everyone else to be successful. Your checkbook is not a measure of success but having meaningful relationships and impacting the world to us is. Maturity…It’s about understanding your abilities and limits while being open to a world that is dramatically changing. It’s identifying one another’s strengths and allowing each person to thrive on those strengths, and at the same time accepting your own weakness, not in a negative way but rather a way to grow internally. Taking an untraditional path is a celebration of our minds, souls, spirits and creativity. The true answers always come from within us and finding the courage to look deep within ourselves is not always easy to do. MAKING YOUR OWN PATH is to take massive, determined action. Without alignment the best strategic plan will never be achieved. Alignment requires a balance of views and a behind closed doors understanding which takes great mutual respect. Being aligned helps you deal with the world effectively, but achieving alignment requires an on-going effort of fostering mutual understanding and routinely building mutual respect. An aligned organization (or relationship) gets things done faster, with less effort and with better results, and is more agile and responsive to the fast-changing conditions we face today. Alignment isn’t about the easy path because the right answer is not usually the easier. Understand the value of alignment and it’s importance to success and getting things done in great partnerships. More about Robert's book and where to buy it here. Finding the right answer requires having the right question. Our method of finding the right answer first of all originates with respect, everything we do relates to respect for each other and other. Don’t get stuck on the ‘That’s how we’ve always done it syndrome.’ Hopefully that kind of mentality was removed from your organization’s DNA early on. Formulate your questions with clarity, on topic, and when you have completed asking the question just SHUT UP and listen. One of the critical components of truly executing this principle is to let go of ego. In my estimation, it’s more important to ask the right questions than it is to have all the answers. Questions allow you to assess the situation. Without listening respectfully, you will not get the answers that will allow you to make the decisions which create alignment. As a gym owner, time can often feel like the enemy. There are so many things on the to-do list, but so little time to get them ticked off. To help you conquer that list, we’ve compiled some of our most popular podcast episodes into one convenient Digital eGuide – to make it even simpler to access the info that will boost your profits and enhance your success. CLICK HERE FOR A VIDEO LOOK INSIDE "9 PARTNERSHIP PRINCIPLES"
When most people create business partnerships, they focus on potential opportunities, their office, titles, mission statements, stationary, logos, social media platforms, and more. But entrepreneurs Bryan O'Rourke and Robert J. Dyer know there is much more to establishing a successful partnership. The founders of Fitmarc, which is a strategic partner with a variety of leading global fitness and wellness players, share nine principles to success in this guide to improving life at work and at home. Whoever you're considering as a partner, values and character should be at the top of the list. You must openly discuss your views without fear of reprisal-and if you can't-you need to ask yourself why. It's also important to realize that no one has the right answers. But you do need to ask the right questions if you want to succeed. In my view success in business has to do with working with people. Relating to them, supporting them and being authentic is both the most essential foundation to creating great organizations and the most human way to be. 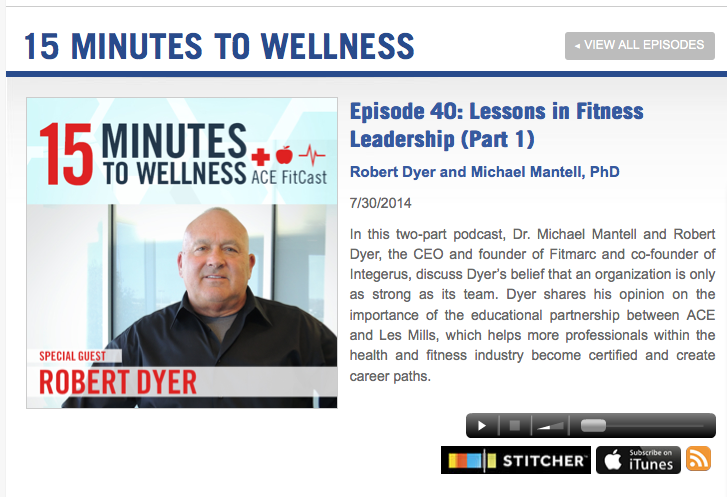 Having communicated and followed Michael Mantell for years in his roles at both the American Council on Exercise and as a consultant for a number of well known fitness brands, I was honored to receive his invitation to talk about not only our businesses Fitmarc and Integerus, but also about the human elements of leadership. He titled it Lessons in Leadership and I really enjoyed spending time with Michael reflecting on the topic. Please check out the interviews and let me know what you think. Its a two part interview that you can listen to here and here. Thanks to ACE and Dr. Mantell for the chance to contribute and thanks to you for visiting my web site.